The gunman also had Molotov cocktails, but he did not use them in the attack, police say. KENNESAW, Ga. – A FedEx employee wearing ammunition draped across his chest “like Rambo” opened fire Tuesday at a package-sorting center outside Atlanta, wounding six people before committing suicide, police and witnesses said. In addition to a shotgun, the gunman also had an undisclosed number of Molotov cocktails, but he did not use them in the attack, police said. The suspect, identified by police as 19-year-old Geddy Kramer of Acworth, was found dead inside. He worked as a package handler at the sprawling facility, Cobb County police Sgt. Dana Pierce said. Investigators have an idea of what his motive may have been, but they were not prepared to disclose it yet, Pierce said. Three of the victims were critically wounded, though only one remained in critical condition by late afternoon. Police say three were in stable condition, and two others were treated and released. Kramer first drove his car to a security shack outside the building and shot a guard there before heading inside, the news release said. David Titus, a FedEx truck driver, said he was just coming to work around 6 a.m. when he saw a security guard shot in the abdomen. He said he heard more gunfire later from inside the building. FedEx clerk Liza Aiken said she was working when she heard something drop, looked to her left and saw the gunman. “He had bullets strapped across his chest like Rambo” and held a knife, Aiken said at the entrance to a parking lot where employees had gathered after the attack. Before she could continue, a woman wearing a FedEx jacket told Aiken to stop talking and led her away. A 28-year-old man who received surgery was in critical condition late Tuesday, while a 52-year-old woman who received surgery was upgraded to stable, police said. A 22-year-old man’s condition was also upgraded to stable. Among the other wounded were a 42-year-old woman and two men, ages 38 and 19. The gunman’s father, Scott Kramer, released a statement expressing the family’s condolences to the shooting victims. “Our prayers are for their complete and speedy recovery. Our thoughts are also with all the workers at FedEx who were affected by Geddy’s actions. We make no excuses for his actions and are shocked and devastated by them. There really are no adequate words at a time like this,” Kramer said. Multiple state and local agencies were working with the FBI to collect evidence at the package center in Kennesaw. The facility about 25 miles north of Atlanta sorts packages and loads them onto vehicles for delivery. It’s next to the general-aviation airport for suburban Cobb County. 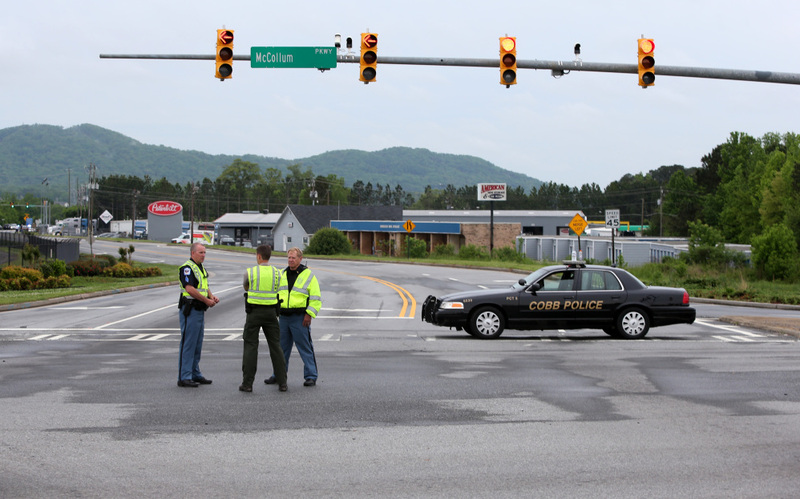 After the attack, police blocked roads leading to the FedEx center. Dozens of workers were taken by car and bus to a skating-rink parking lot to call relatives for rides. 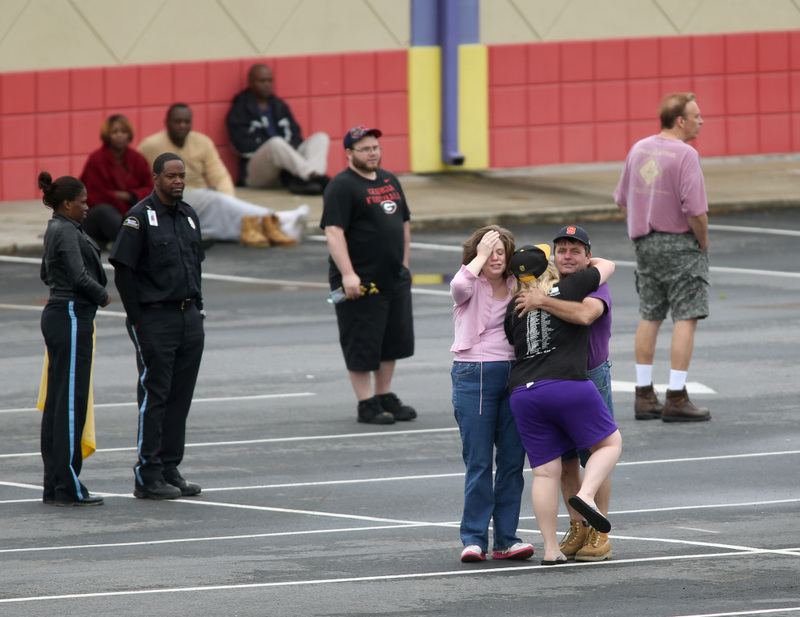 Some family members got out of their cars and hugged the workers. Several employees said they had been told not to speak with reporters. The package center was shut down and surrounded by crime-scene tape. The full investigation is expected to take a long time because authorities have to search every part of the 500,000-square-foot facility for evidence. Later in the day, the man’s car was towed from the scene and employees were allowed back to pick up their vehicles and go home for the day.